MangaGamer has announced the start of their “end of summer sale”, featuring some of their latest and most popular titles and tie-ins. English visual novel and eroge publisher MangaGamer has started its end of summer sale, discounting their latest and most popular titles by up to 50%. The sale will last from the 5th to the 19th of August. August 5th, 2016–Join MangaGamer for a hot End of Summer Sale! Summer’s almost over, but the heat’s still blazing and we’ve got some hot deals for you to kick off the last few weeks of the summer season! We’re offering up to 50% off on all of our latest and greatest titles, so don’t miss out on your chance to get a great deal on some of the best Visual Novels ever released! Sale ends on August 19th, so don’t wait! 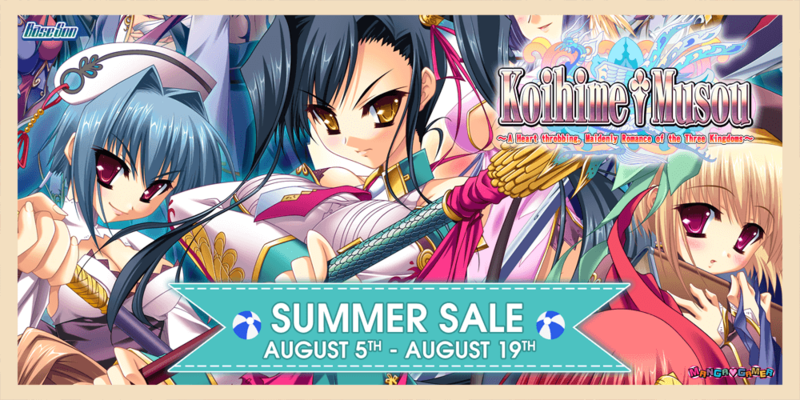 You can check out the full list of titles on sale at our Summer Sale page! Join us @MangaGamer on twitter and let everyone know which title you think is the hottest! If you enjoy our content and would like to support us, please consider donating to our Patreon . You could also follow us on Twitter and Tumblr for more news and announcements.